FamilyFarmed and Good Food on Every Table are honored to re-publish, with permission, a column by music legend Willie Nelson about Farm Aid, the organization that advocates for family farmers and is best known for its annual concert that raises money to support those farmers and help them stay on their land. The Farm Aid organization announced today that the concert — featuring Nelson, Farm Aid co-founders Neil Young and John Mellencamp, fellow Board member Dave Matthews, and other well-known performers — will be held in our hometown of Chicago on Saturday, Sept. 19 at FirstMerit Bank Pavilion at Northerly Island. In his column, Nelson describes the origins and goals of FarmAid, and urges advocates of the fast-rising Good Food movement to make sure that family farmers get their fair share of the benefits from the movement’s rapid growth. In the 1980s, as I toured the country on my bus Honeysuckle Rose, I made it a habit to stop in at diners and truck stops, to talk to folks there. I heard familiar stories that brought me back to my upbringing in rural Texas. And it was from those folks that I came to understand the challenges our family farmers and rural residents face… and to see what a tremendous resource they are to all of us. Farm Aid, which has advocated for family farmers since its founding in 1985, will come to Chicago to hold its 30th anniversary concert on Sept. 19, with activities to raise public awareness about our food system planned for the previous two days. Farmers, farm wives, and friends of farmers told me about what was going on in the Heartland. They may have only been looking for an ear to witness their story. Or they may have thought that I could help. Either way, I could not let them down. This is how Farm Aid started in 1985: by listening to farmers. It was the height of the Farm Crisis, which pushed hundreds of thousands of family farmers off the land. John Mellencamp, Neil Young and I, and 50 more artists, held a concert to raise money to help farmers and build awareness to put an end to the policies that pushed family farmers off the land and paved the way for industrial, corporatized agriculture. John often says now that we were naïve to think that just one concert would fix things. I suppose we were. Thirty years later we are still here, standing up and pushing forward with family farmers to keep them on their land growing good food for all of us. And we won’t stop, because we keep listening to farmers and rural residents who tell us what the industrialization of farms and food is doing to our soil and water, our communities, and our health. 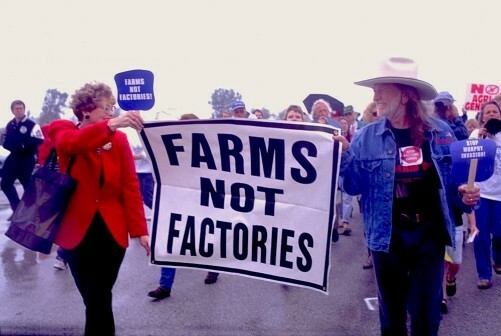 It was in the 1990s that we at Farm Aid heard from the countryside about the rise of factory farms. Farmers told us what these giant pork factories were doing to their towns. The factory farms polluted the water and the air, making it impossible for rural folks to enjoy their own homes. They were forced inside, with the windows closed, to escape the stench. They lost financial security as their property values plummeted. They lost the diversity of their farms as they were forced to compete with agribusiness on an industrial scale. And they lost not just their livelihoods, but the legacy that was passed down to them through the generations. I went there, to Iowa and Missouri, to stand with family farmers. Music legend Willie Nelson (right) co-founded Farm Aid in 1985 with fellow stars Neil Young and John Mellencamp. They will appear along with fellow performer Dave Matthews, who joined the Farm Aid board in 2001, at the 30th anniversary concert in Chicago Sept. 19. Farm Aid listened and we acted with farmers, each step of the way. The farmers knew the strategy for organizing their neighbors. They are the grass roots, capable of turning out thousands to rally against the politics and policies that bring corporate consolidation to the countryside. They are rooted in their community, which gives them the strength and commitment to fight, for years, for their own sake and for the sake of their neighbors and their children and grandchildren. Later in the 1990s, we learned about GMO seeds, from you guessed it, family farmers. It was family farmers who first heard about the supposed benefits of genetic engineering before any concerned eater ever encountered a GMO product in the grocery store. The farmers who reached out to Farm Aid told us that they wanted to organize a campaign to make sure that all farmers knew what genetic engineering was and how it could affect their crops, their land, their markets, and their livelihoods. Farm Aid supported the farmers and helped get the Farmer to Farmer Campaign on Genetic Engineering off the ground. Today’s movement to regulate and label (and even ban) GMOs has its roots in the farmers who first organized around these issues in the 1990s. Today, Farm Aid celebrates the power and potential of the Good Food movement. People everywhere are searching out family farm food, asking for it at their local grocery stores and restaurants. 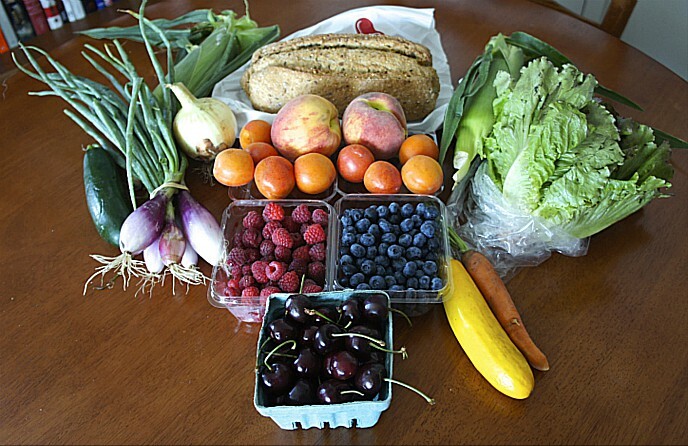 The United States has more than 7,000 farmers markets, and the CSA model where eaters become “shareholders” in a local farm has spread like wildfire. New, young farmers are coming on the land, with college degrees and often no family background in agriculture, but with a passion and ingenuity that is changing the landscape. Articles, books, and films tell the story of our food system, and spokespeople have become well-known leaders of this movement. But as the movement picks up steam, I worry that too often the family farmer voice is not heard — even by people who love their good food. 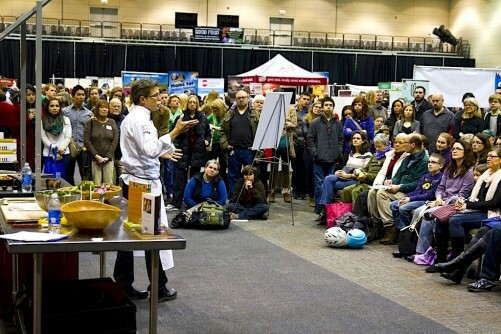 The promise of the Good Food movement lies not merely in all of us knowing and speaking out about the critical importance of our food, but in the connections we cultivate with family farmers. With those connections established, we can support farmers in new ways — with our dollars, yes, but also with our voices, at the town hall, at the ballot box… everywhere we go. Each one of us can participate in the culture of agriculture by cooking, sharing, and growing our own food when we can, and learning from our farmers. When it comes right down to it, there is no Good Food movement without family farmers. And its success depends not only on our supporting “local” and “organic” and “sustainable,” but also on our recognition and respect of the wisdom and experience of family farmers and rural folks. We face tremendous challenges to right our farm and food system. But the solutions are on the shelf, as I like to say. We only need to open our ears, hearts, and minds to truly listen. This entry was posted in Community Supported Agriculture, Conventional agriculture, Family Farms, Farm Aid, Farm businesses, Food policy, Good Food movement, Good Food Policymaking, Small Farmers and tagged Dave Matthews, Family Farmed, Family Farmer Advocacy, Family Farmers, Family Farms, Farm Aid, Farm Aid 2015 concert Chicago, Farm Aid concert, John Mellencamp, Neil Young, Willie Nelson. Bookmark the permalink.